What Is DA Form 3161-1? 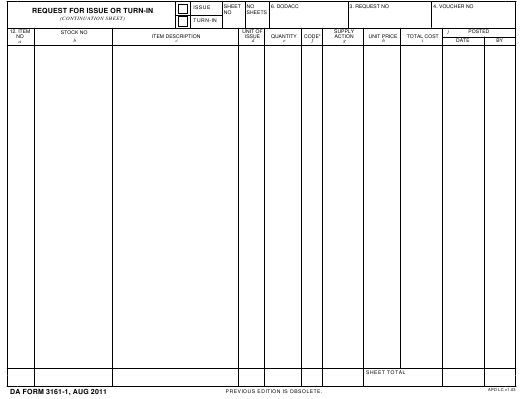 DA Form 3161-1, Request for Issue and Turn-In (Continuation Sheet) is a form used for listing U.S. Army inventory issued to a certain person or company. This particular form serves as a continuation sheet for the main DA Form 3161. The latest version of the form - sometimes confused with DD Form 3161 - was released by the Department of the Army (DA) in August 2011 with all previous editions being obsolete. An up-to-date DA Form 3161-1 fillable version is available for digital filing and download below or can be found through the Army Publishing Directorate website. There are two forms related to the DA 3161-1: DA Form 3161, Request for Issue and Turn-In, used as a record of issued inventory, and the DA Form 2062, Hand Receipt/Annex Number, a multi-purpose form is used to record issuings of Army property. Additional information and filing guidelines can be found in the Department of the Army Pamphlet 710-2-1, Using Unit Supply System (Manual Procedures), released in December 2016. The official filing the form must label it as a request of either issue or turn-in by selecting the appropriate option in the first box. The top line of the form also requires a page number for each attached continuation sheet and the total number of sheets used as a set. Other lines require providing the DODAAC, request, and voucher numbers. The main block of the form requires the information on each item issued or turned-in. Every entry should be numbered and must contain the stock number and brief description of each item as well as the unit of issue, quantities of the same items, supply action codes, unit prices, and the dates posted. The total price of the items listed should be entered at the bottom of the form. The continuation sheet should be attached to the main DA 3161. A copy of the DA 3161-1 should be filed away in order to ensure proper recordkeeping of all items throughout the supply chain.